1909 The 61-year history of Shibe Park begins with the A's defeating the Red Sox, 8-1. The Philadelphia stadium, which will be renamed to honor Connie Mack in 1953, is the first concrete and steel ballpark in major league history. 1916 The Giants start the season on the road with a 5-4 loss to Philadelphia at the Baker Bowl. The game marks the debut of New York's new purple plaid uniforms, fortunately, a trend that will last only a year. 1931 Former Cubs pilot Joe McCarthy makes his debut as Yankee manager, beating Boston at the Bronx ballpark, 6-3. The future Hall of Fame manager, who is the team's all-time leader in managerial wins with 1460, guides the club to eight pennants and seven World Championships during his 16-year tenure in the Bronx. 1953 During a preseason exhibition game in Brooklyn, the Ebbets Field public address announcer informs the crowd, including the new dad as he approaches home plate to bat, "Mickey doesn't know it yet, but he has just become the father of an eight-pound, twelve-ounce baby boy." Mickey Mantle Jr., whose given middle name is Elven in memory of the Yankee slugger's recently deceased dad, is the first of four children, all sons, with his wife, Merlyn. 1955 Pinch-hitting for Warren Spahn, Chuck Tanner, who becomes better known for his managerial skills, hits a home run for the Braves on the first pitch of his first major league at-bat. The 26 year-old outfielder's eighth-inning round-tripper off Gerry Staley ties the score in Milwaukee's eventual 4-2 victory over Cincinnati at County Stadium. 1955 At Municipal Stadium, the recently arrived Athletics beat the Tigers, 6-2, in their first game in Kansas City. At first, the franchise's shift from Philadelphia will be warmly received by the Missouri fans as the A's draw 1,393,054 patrons to the ballpark in their first season, second only to the Yankees in American League attendance. 1960 In the first game ever played at San Francisco's Candlestick Park, after Vice President Richard Nixon throws out the ceremonial first pitch, Giants' starter Sam Jones three-hits the Cardinals, 3-1. During the third inning, the foul poles are discovered to be located entirely in fair territory, leading to a protest made by the umpires. 1962 Pete Richert, making his major league debut, comes out of the bullpen and strikes out the first six batter he faces, a major league record. The rookie southpaw fans four in the third inning in LA's 11-7 comeback victory over the Reds at Dodger Stadium. 1965 In Cincinnati, Joe Torre hits two home runs in Milwaukee's 4-2 Opening Day victory at Crosley Field. Next season on the same date, the Braves catcher will do it again, joining teammate Eddie Mathews as the only major leaguers to have hit two round-trippers twice in games played on Opening Day. 1966 On Opening Day, Jim Lonborg's 13th-inning balk plates Bob Johnson with the deciding run in Baltimore's 5-4 victory. The Red Sox reliever miscue on the mound occurs with two outs and the bases loaded at Fenway Park. 1967 On Opening Day at Boston's Fenway Park, the Red Sox draw only 8,324 to watch the team beat Chicago, 5-4. The eventual American League champs finished last season in ninth place with a 72-90 record. 1988 Frank Robinson replaces Cal Ripken Sr. as the Orioles' manager after the team gets off to a 0-6 start. The new skipper, who has previously managed the Indians and Giants, will be winless in his first 15 games in the Baltimore dugout. 1988 Bobby Witt ties an American League record, committing four balks in the Rangers' 4-1 loss in Detroit. The major league record for the most balks in one game is five, established in 1963 by Braves' right-hander Bob Shaw, which included three in the third inning of the team's 7-5 loss to the Cubs at Wrigley Field. 1990 Brett Butler walks five times in the Giants' 13-4 win over the Braves at Atlanta-Fulton County Stadium. The speedy outfielder will score four times after being issued a free pass. 1993 Barry Bonds, who signed a six-year, $43 million deal as a free agent, the richest contract in baseball history, delights the crowd of 56,689 at Candlestick Park by homering in his first at-bat in front of the hometown fans. The clean-up hitter's second-inning drive to deep right field off Chris Hammond proves to be the difference in San Francisco's 4-3 extra-inning victory over Florida. 1994 Scott Cooper hits for the cycle and drives in five runs, helping the Red Sox to rout the Royals at Kauffman Stadium, 22-11. The third baseman's fifth-inning triple is the result of being thrown out at the plate trying to stretch the three-bagger into an inside-the-park home run. 2001 The Blue Jays postpone the game against the Royals when SkyDome's retractable dome gets jammed during a routine test opening, sending chunks of the roof, some as big as eight feet by six feet, crashing onto the field below. The gaping hole in the dome is clearly visible from the outside of the ballpark, making the damage easy to spot by the city's commuters on a nearby expressway. 2001 The combat-ready Padres, wearing camouflage jerseys and green caps, finally win the battle against the Giants, after five consecutive losses to the black and orange, 8-3. San Diego donned the uniforms to honor the area's significant military population. 2002 Barry Bonds, with his 574th career round-tripper, passes former Twin first baseman Harmon Killebrew on the all-time home run list. The Giants' left fielder hit his milestone homer, which ranks him sixth overall, in the first inning off Nelson Figueroa in the Giants' 3-2 victory over Milwaukee. 2003 Fenway's Green Monster, the left field wall in the major league's smallest park, has a new look. In the place of a net that was used to collect home runs balls that cleared the wall, the fans now occupy the space, sitting 310 feet away and 40 feet above the field, as they watch Red Sox right-hander Pedro Martinez give up ten runs in 4.1 innings in a 13-6 loss to the Orioles. 2003 With a 5-2 victory over the Indians at Cleveland's Jacobs Field, the Royals set a franchise record for victories at the start of the season, winning their ninth consecutive game since Opening Day. In 1977, Kansas City won 16 straight from August 31 through September 15 for overall team's mark for consecutive wins. 2004 At the Giants' home opener at SBC Park, the torch is passed both literally and figuratively as Barry Bonds hit his 660th career homer to tie his godfather, Willie Mays, for third on the all-time home run list. The 72 year-old Hall of Famer Mays greets his godson at home plate with a torch studded with $18,000 of diamonds forming the numbers 660, 25, which is Barry's number, and 1, the number to needed move ahead. 2004 In front of a sellout crowd of 41,626 fans, the Phillies play their first game in their $458 million Pattison Avenue ballpark. On a cloudy day, the Citizens Bank Park history begins with a 4-1 loss to the Reds with right fielder Bobby Abreu hitting the park's first homer, accounting for Philadelphia's only run. 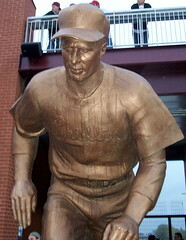 2004 A ten-foot bronze statue of Richie Ashburn is unveiled at Citizens Bank Park, the new home of the Phillies. Zenos Frudakis's work of the five-time All-Star, located behind centerfield in Ashburn Alley, which features the team's Walk of Fame. 2006 Twenty-two year-old college senior Jeffrey Maier hits a third-inning two-bagger against Bates to become the all-time career hits leader at Wesleyan, with 169, surpassing the 2003 mark set by Bill Robinson. The 5-foot-11, 190-pound third baseman gained national notoriety a decade ago as a 12 year-old young fan when he leaned over the Yankee Stadium fence to catch Derek Jeter's fly ball 'homer,' which prevented Orioles outfielder Tony Tarasco from catching the ball during the 1996 ALCS. 2009 With runners taking off from first and second base, Pirates' shortstop Jack Wilson Reds third baseman Edwin Encarnacion's turns soft liner into a triple play. The triple killing is the Bucs' first since 1993, and the team's first on the road in 41 years. 2010 On an unusually warm spring day, the hometown Twins beat Boston, 5-2, in the first regular-season game played at Target Field. Minnesota DH Jason Kubel hits the ballpark's first home run, a seventh-inning shot into the right-field seats. 2011 The Rakuten Eagles, unable to use their stadium due to the extensive damage caused by last month's massive earthquake and tsunami, beat the Chiba Lotte Marines at QVC Marine Field, 6-4, in Japan's Pacific League opener. The crowd of 22,525 attending the game are not disturbed feeling an aftershock at the ballpark caused by an earthquake in Chiba earlier in the day.